It’s been a hot year for the record books. Many parts of the country have or are experiencing all-time high temperatures. The National Centers for Environmental Information, more commonly known as NOAA, reports that more than 1,000 high heat records have been broken this summer in cities and towns throughout the United States. Some of the previous high temperatures date back more than 110 years. Plus, since the Summer of 2018 is not yet two-thirds over, more record-breaking temperatures are possible. So far, Death Valley, California leads the pack hitting 127 degrees Fahrenheit on the Summer Solstice, the first day of summer. Since then, more than 10 towns logged 115+-degree days in the first month of Summer 2018. Central Texas, an area experiencing a string of sizzling days has already doubled its number of triple-digit temperatures compared to last year. The most triple-digit and record-breaking temperatures have occurred in Texas, Arizona, Nevada, and Mexico. 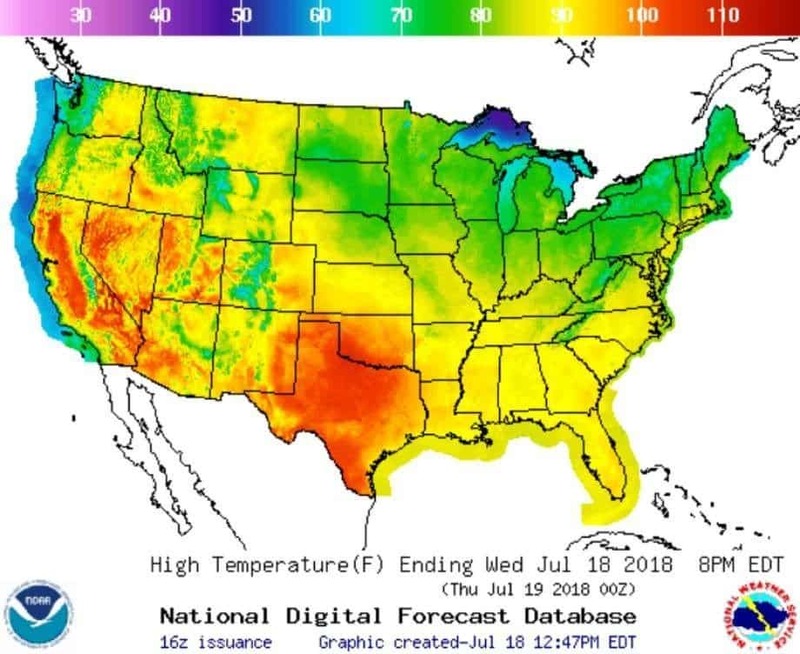 But this year, areas not accustomed to such high temperatures are sweltering too – including Memphis, Tennessee (113), Long Beach, California (109), and Walsh, Colorado (107). These hot and dry weather conditions have also contributed to a large number of fires this season that have forced many to evacuate their homes and buildings. Ninety mega-fires have burned more than one million acres in 14 western states this summer. California has been challenged with 20 mega-blazes in recent days, including those impacting lives and property in and around Redding and other parts of the northern part of the state. Heroic firefighters battling on the frontline have developed techniques to help them weather the firestorm. Firefighters on the frontline perform heroic tasks to help protect our lives, property, and the environment. Learn more about what firefighters do to prepare for extreme heat conditions in this 6-minute video. Staying healthy – and cool – in extreme temperatures requires knowledge, planning, and the right tools. Drinking plenty of water is of prime concern in hot conditions, of course, but being properly hydrated might impact us in more ways than we realize. A study, from the Yale School of Medicine, found that when people become dehydrated, they achieved 12% more errors in a cognitive flexibility test, especially surrounding complicated tasks. But those same type of errors decreased and functions returned to normal when they rehydrated. Another study, from the Harvard T.H. Chan School of Public Health, found that extreme heat negatively impacted the memory and cognitive speed of college students. Staying hydrated is vital, but the signs for determining your correct hydration level might not be obvious. Staying healthy in the heat starts with fluids, but how much do we really need to drink? While it can vary somewhat by body size and type, according to the National Academies of Sciences, Engineering, and Medicine; in the heat of the summer, women should drink at least 91 ounces of water each day. For men, the suggested level is 125 ounces. Despite a commonly held belief, the NASCM determined in a recent study that coffee and caffeinated beverages, in moderate quantities, had no detrimental effects on hydration levels. So, feel welcome to enjoy your cup (or two) of Morning Joe – even on extremely hot days. But, then, perhaps you’d prefer an iced coffee? Despite our best intentions, each of us can get overheated — especially on a blistering hot day. In outdoor work and high-intensity situations, it’s wise to be aware of the clues that indicate you, a co-worker, or friend are suffering from overheating. If you learn to detect the clues regarding heat stress, you can be proactive and reduce or prevent the possibility of serious problems. Let’s start with ourselves. Since there might be times when we sweat out more fluids than we take in, how can we tell if we are dehydrated? The easiest way to confirm your own status is to check the color of your urine. Generally, the darker the color, the more likely you are to be dehydrated. Brown or dark orange color urine is cause for concern. Urine that looks like pale lemonade typically indicates that you are properly hydrated. In terms of co-workers and friends, your observation of outward signs of heat-related distress is crucial. The National Institute for Occupational Safety and Health (NIOSH) has developed a helpful chart for recognizing and addressing heat disorders. An informative 2-1/2-minute video from the National Safety Council details the steps to take to help a co-worker or friend experiencing a heat-related problem. Planning ahead is another way to minimize risks. To help individuals and business schedule the best times for outside activities in extreme heat conditions, a mobile device app was developed and recently updated by the Occupational Safety and Health Administration (OSHA) and NIOSH. The Heat Safety Tool gauges, hour by hour, the heat index in your area. The heat index is a measure of how hot it “really” feels when relative humidity (the amount of moisture in the air) is taken into account along with the actual air temperature. The easy-to-use, free app also includes valuable heat safety tips and guidelines. The Heat Safety Tool can be downloaded from the Apple App Store (iPhones, iPads) and Google Play Store (Android devices). Heat safety resources can help you address a heat stress-related emergency, but there are also steps you can take every day to minimize the impact of extreme weather. Plan out your day. – Schedule your most strenuous tasks for the morning hours, when you are fresh, and the heat won’t impact your efficiency as much. Schedule your routine chores in the afternoon when you might start to feel a bit drained by the heat. You can use the Heat Safety Tool app to preview and monitor the heat index throughout the day. Dress light and less formally. – Wherever possible, choose looser fitting items. Clothing that is 100% linen, cotton or viscose will feel cooler than polyester or synthetic materials. When outdoors, wear long, loose sleeves to reduce the possibility of sunburn. If your primary duties are mostly indoors and you need to keep to the company’s dress code, select a “light and loose” version to stay as cool as possible. Keep water nearby and sip often. — Experts say that if you feeling thirsty, you’ve probably somewhat dehydrated already. Be proactive! Women should drink a minimum of 2 1/2 liters of water throughout the day, and for men, at least 3 1/2 liters. Choose a fresh lunch for immediate refreshment. – A slice of watermelon, a cup of frozen fruit, a piece of cucumber, or a green salad can help replenish the fluids in your body and provide a healthy snack. Be more cautious when working outside. — If you work outside at moderate intensity for just one hour you can reach up to 2% dehydration. That doesn’t sound like it should be a huge problem. But, for the average-size person, 2% can equal sweating out about one liter of water. Plus, in severe work conditions, you could reach that level in about 30 minutes. Practice OSHA’s message on working safely in the heat: “Water. Rest. Shade.” This means that on hot days, take frequent breaks in a cool or shady area and drink water every 15 minutes. Establish good office habits. – As tempting as it is to burrow indoors in at your desk on hot days (or inclement weather in general), long-term health benefits are realized by using good posture, performing flexing and stretching exercises periodically, and practicing good office ergonomics. Whether you’re in the office or out maintaining a proper posture helps prevent neck and back pain. For the average office worker who spends from 6 to 8 hours each day at his or her desk, researchers emphasize the importance of altering positions throughout the workday to avoid unnecessary stress on the lower back and pelvis area. An adjustable, Sit-to-Stand desk can be your great ally because it enables you to work comfortably in a stress-free position either sitting down or standing up. If you ever experience severe symptoms of your body overheating, please take the necessary precautions to cool your body down and have someone call 911 Emergency Services on your behalf. Look to Formaspace Office for your ergonomic office furniture solutions that help your work community stay healthy. Formaspace Office offers the popular WELDMARX I “Sit To Stand Desk” for all your ergonomic work environments. With the new Formaspace Office Virtual Furniture Designer, you can easily design your office furniture 100% online with accurate photorealistic renderings of any office desk in the WELDMARX line, as well as conference and lounge tables, storage pieces, and communication boards. All Formaspace Office products are backed by our 12-year, no-questions-asked guarantee. These high-quality office furniture products are proudly made in the USA at our factory headquarters in Austin, Texas. To learn more about ergonomic solutions, contact one of our friendly Formaspace Office Design Consultants today. Give us a call, we would love to hear from you!